Harwich is a pleasant, coastal town, the gem of the Sunshine Coast, full of history and character with a strong sense of community. Harwich Town Council is working hard to ensure that Harwich and Dovercourt continues to thrive and regeneration remains a top priority. Following the Royal Charter of 1604 (King James Ι) the town has seen a continuous line of Mayors, elected by the Council for a yearly term of office. The next Mayor making ceremony will be on 23rd May 2019. The church service, at 12 noon to which all are welcome, is followed by the rare custom of kitchel throwing from the upper Guildhall windows. It is a lot of fun for the members of our community who scramble to catch the freshly-baked treats. The entire ceremony is unique to Harwich and has been a local tradition for centuries. Set in the heart of the historic old sea port, Harwich’s Guildhall is the town’s only Grade 1 listed building, dating back to the seventeenth century and is home currently to Harwich Town Council. The wealth of history and heritage that it contains, along with its remarkable architecture, make the Guildhall in Harwich a fascinating place to visit. Entry to the Guildhall is free, so please call 01255 507211 where staff will be happy to arrange a guided tour. The Chamber is a beautiful oak paneled room, its walls adorned with large portraits and its windows including a stained glass depiction of the town crest. The Chamber also houses the regalia show case containing the seventeenth century mace and the Mayor’s chain of office. 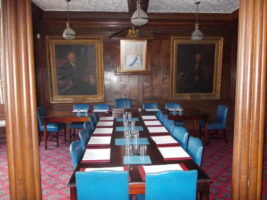 The Chamber is available to hire for meetings, so please contact the office for details and availability. Amongst the treasures in the Mayor’s Parlour are the town’s Imperial Brass Yard and a portrait of Charles II painted in the year 1675. A unique feature of the Guildhall is the Carvings/Graffiti room, or Gaol, once used to hold prisoners waiting to be tried or sentenced. Etched into the bare wooden walls are elaborate carvings of ships, gallows and symbols designed to ward off evil spirits, some of which date from the end of the eighteenth century. 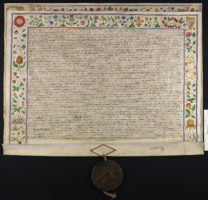 Our honorary Archivists manage the Council’s archives and amongst the hidden delights there is the Royal Charter of 1604, which incorporated the village of Dovercourt and the Borough of Harwich and allowed the appointment of a Mayor and Council, comprising ‘honest and discreet burgesses’ who served for life, and the election of two members of Parliament. Council minutes date back to this time, maps are held from the 16th century and material dating back to Richard II in the 14th century. A large photographic collection is held covering a wide range of local events and interests over the years. Many of these documents are displayed at the two exhibitions held annually, during the Harwich Festival and Heritage Weekends. Talks on the history of the town and assistance with personal research can be arranged by appointment with the Archivists. The revitalized Friday market situated in the High Street continues to thrive and the first phase of ‘Dovercourt Rediscovered’ is underway following the installation of heritage lamp posts and community tourist maps. This project will continue to evolve in consultation with the District and County Council. Harwich Town Council grant funding supports many local groups and organisations working within the community. The town is extremely fortunate to have a large network of volunteers and we wish to thank them for the time and invaluable support they give to help enrich our community. These people are a fine example of the community spirit previously referred to and their efforts, along with that of the town and District Councils, will, we are sure, mean that Harwich & Dovercourt continues to move forward in the coming year.